Gu Kaizhi (ca. 345-ca. 406) who lived in the Six Dynasties period (222-589) is considered to be the orthodox founder of Chinese figure painting. The flowing lines and floating cloud motifs by means of which he wished to express elegant grace, exquisite bone and pure appearances or other spirit resonances are generally referred to as the lofty antique gossamer drawing style. 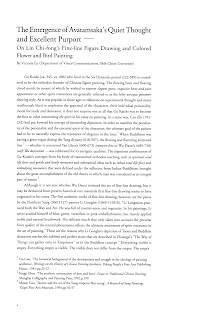 As it was popular in those ages to elaborate on supernatural thought and many intellectuals liked to emphasize the appraisal of the characters, their individual personality, moral fortitude and demeanor, it does not surprise one at all that Gu Kaizhi was to become the first to value transmitting the spirit in his essay on painting. In a same way, Cao Zhi, (192-232) had put forward his concept of outstanding disposition. In order to manifest the peculiarity of the personality and the essential spirit of the characters, the ultimate goal of the painter had to be to naturally express the resonance of elegance in the lines. When Buddhism was having a great vogue during the Tang dynasty (618-907), the flowing and fluttering animated line—whether it concerned Yan Liben’s (600-673) ironwire line or Wu Daozi’s (689-758) swift Wu decoration—was celebrated for its energetic qualities. 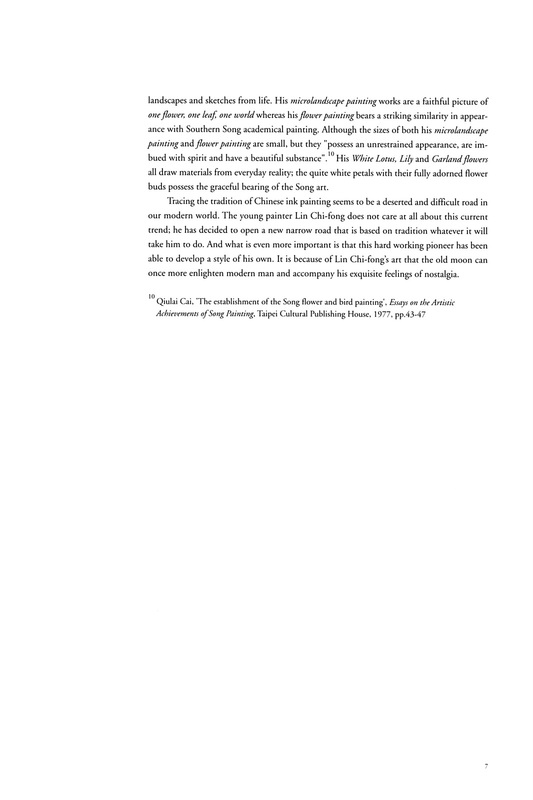 The ingenious combination of Gu Kaizhi’s concept from his body of transmitted orthodox teaching such as spiritual vital life force and gentle and lovely resonance and substantial ideas such as robust vitual life force and embodying resonances that were defined under the influence from Indian Buddhism, brought about the great accomplishment of the old theory in which man was considered as an integral part of nature. 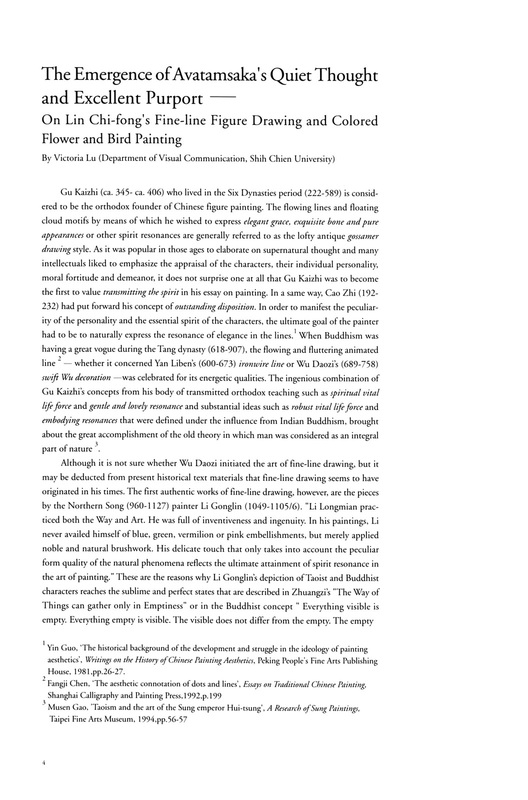 Although it is not sure whether Wu Daozi initiated the art of fine-line drawing, but it may be deducted from present historical text materials that fine-line drawing seems to have originated in his times. The first authentic works of fine-line, however, are the pieces by the Northern Song (960-1127) painter Li Gonglin (1049-1105/6). “Li Longmian practiced both the Way and Art. He was full of inventiveness and ingenuity. In his painting, Li never availed himself of blue, green, vermilion or pink embellishments, but merely applied noble and nature brushwork. His delicate touch that only takes into account the peculiar form quality of the natural phenomena reflects the ultimate attainment of spirit resonance in the art of painting.” These are the reasons why Li Gonglin’s depiction of Taoist and Buddhist characters reaches the sublime and perfect states that are described in Zhuangzi’s “The Way of Things can gather only in Emptiness” or in the Buddhist concept” Everything visible is empty. Everything empty is visible. The visible does not differ from the empty. The empty does not differ from the visible”. The paining Washing Clothes by the Southern Song (1127-1279) artist Mou Yi carried on the style of Lin’s fine-line drawing, but surpassed Lin Gongmian and followed instead the lofty antiqueness style that once prevailed during the Wei (386-534) and Jin (265-420) dynasties. But he changed the buoyancy of the Six dynasties characters and incorporated the rich and thick qualities of Zhang Xuan’s (mid-8th c) and Zhou Fang’s (ca.740-800) oeuvre. He then transformed the splendor of Zhou Fang into a delicate tableau that implied parting sorrows and sad thoughts. 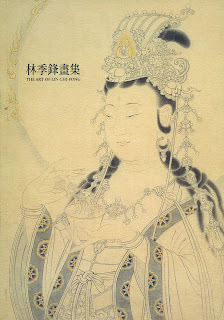 Lin Chi-fong’s passion for fine-line figure drawing became evident during his study at the fine arts department of Tunghai University; his copying of the Song painting Dipankara Buddha instructs Sakyamuni aroused his interest in the genre. As Lin Chi-fong was born in a family of devout Buddhist believers, he has been blessed with a compliant and quiet disposition. When starting to draw an image of Buddha, he sees to it that he feels relieved and concentrated un order to be able to single-mindedly depict the majestic aspects of dharma as conceived in his own mind. It may take several months of uninterrupted labor to finish one painting. Although the images of the Buddhist patriarchs, Avalokitesara, arhats, Vimilakirti, and other characters are modeled after compositions in old paintings, but it goes without saying he is doing more than merely copying. Lin Chi-fong rather challenges the ancients and wants to transcend their state of mind. Even though the various postures, the mudras and the attributes held by the characters are based on materials from the past, but the buns, heavenly robes, necklaces of jade and pearls, armlets, wristlets, pedestals and heavenly crowns have been re-produced through his careful brushline. This creative method of accumulating the great achievements of the old times and making some well-thought changes doubtlessly differs from slavishly copying ancient paintings without digesting them. Lin Chi-fong’s delineated fine-line drawings are the product of careful and precise craftsmanship. The flawless precision and the fine and meticulous brushwork through which he puts every minute detail on the surface were hitherto unknown to me. It has been six years for now since Lin Chi-fong held a public exhibition of his drawings. While preparing for this new solo-exhibition he has been living like a hermit who uninterruptedly devoted his attention to the study of Buddhist images and fine-line drawing. Although ancient paintings serve as a model for his own work, but he is by no means limited to copying his forebears. He chooses instead to challenge and surpass his own person by seeing to it that the energy of the fine brushlines may penetrate the back of the surface and the lines are in tune with the status and stature of the characters. All these qualities and their imbuement with fantastic fluctuations by coupling hardness with softness are used by Lin Chi-fong to express a wide variety of different postures and dispositions. The new works apply the moss speckles brushwork and develop a technique in which misty light ink hues bring the lines in relief. Lin Chi-fong also embellishes some parts of his drawings by tracing designs in gold or applying a wash technique. 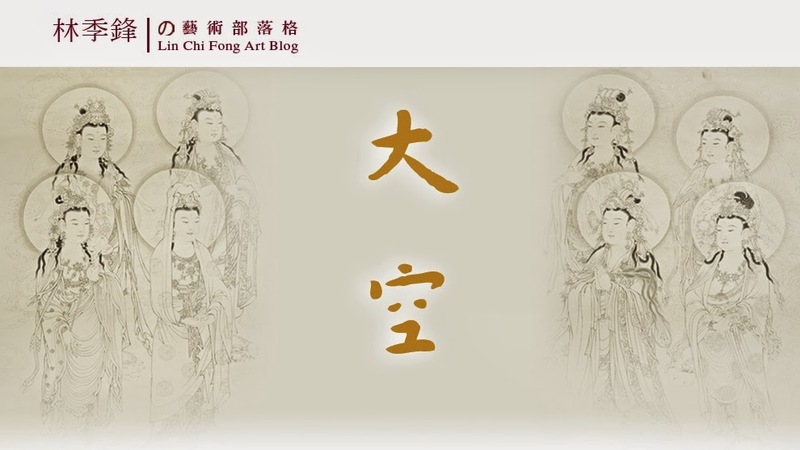 These techniques do not only add the final touch to his works of art, but also imply the flourishing of elegance and beauty just like the paintings of Mou Yi who modified Zhou Fang’s style. Except for delineated figure painting, Lin Chi-fong also excels in flower and bird painting. For Lin Chi-fong flower and bird painting is a kind of imagined outdoor paradise in which he can let his mind freely wander. During his academic education this genre was actually his major as where fine-line figure drawing was merely a minor. He cultivated the art of flower and bird painting with facility and high proficiency. 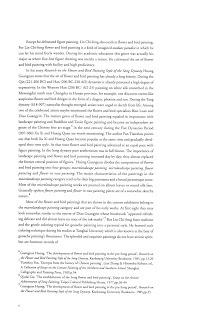 In his essay Research on the Flower and Bird Painting Style of the Song Dynasty Huang Guangnan states that the art of flower and bird painting has already a long history. During the Qin (221-206 BC) and Han (206 BC-220 AD) dynasties it already possessed a high degree of expressivity. In western Han (206 BC-AD 25) painting on white silk unearthed in the Mawangdui tomb near Changsha in Hunan province, for example, one discovers totem-like auspicious flower and bird designs in the form of a dragon, phoenix and sun. during the Tang dynasty (618-907) naturalist thought emerged; artists were urged to sketch from life. Among two of the celebrated artists maybe mentioned the flower and bird specialists Bian Luan and Diao Guangyin. The mature genre of flower and bird painting equaled in importance with landscape painting and Buddhist and Taoist figure painting and became an independent art genre of the Chinese fine art stage. In the next century during the FiveDynasties Period (907-960) Xu Xi and Huang Quan are worth mentioning. The author Pan Tianshou points out that both Xu Xi and Huang Quan became popular at the same time and gradually developed their own style. At that time flower and bird painting advanced at an equal pace with figure painting. In the Song dynasty pure aestheticism was in full bloom. 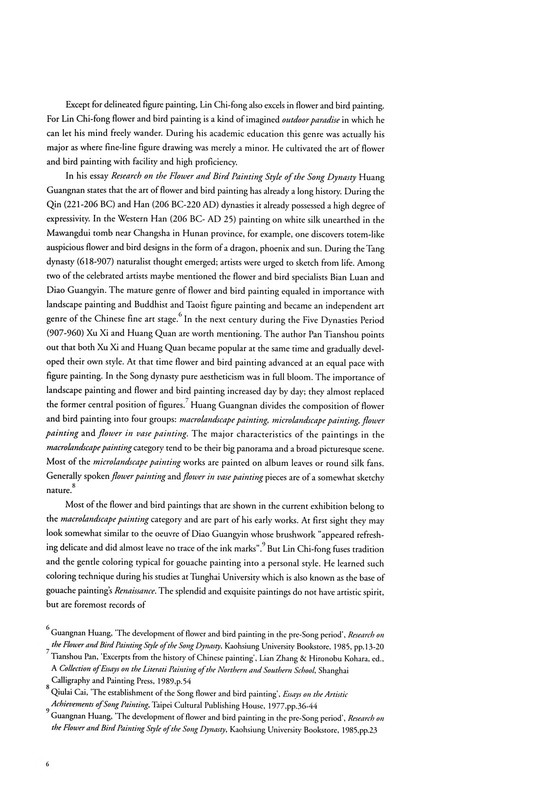 The importance of landscape painting and flower and bird painting increased day by day; they almost replaced the former central position of figures. Huang Guangnan divides the composition of flower and bird painting into four groups: macrolandscape painting, microlandscape painting, flower painting and flower in vase painting. The major characteristics of the paintings in the macrolandscape category tend to be their big panorama and a broad picturesque scene. Most of the microlandscape works are painted on album leaves or round silk fans. Generally spoken flower painting and flower in vast painting pieces are of a somewhat sketchy nature. Most of the flower and bird paintings that are shown in the current exhibition belong to the macrolandscape painting category and are part of his early works. 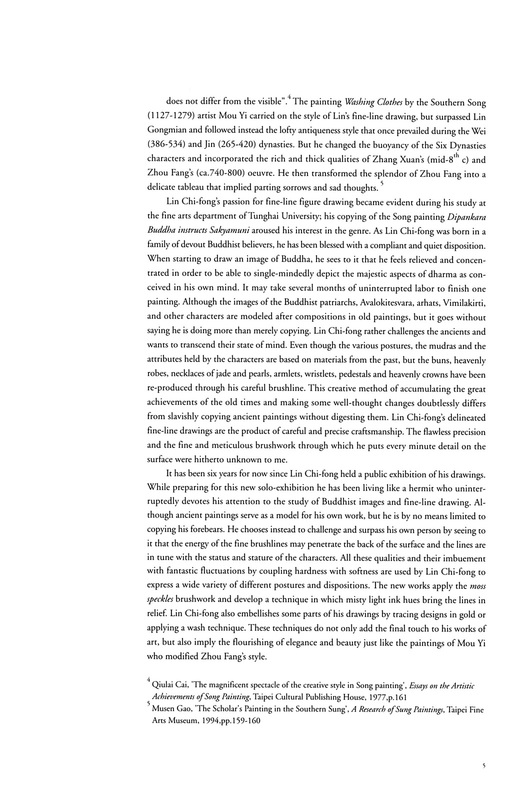 At first sight they may look somewhat similar to the oeuvre of Diao Guangyin whose brushwork “appeared refreshing delicate and did almost leave no trace of the ink marks”. But Lin Chi-fong fuses tradition and the gentle coloring typical for gouache painting into a personal style. He learned such coloring technique during his studies at Tunghai University which is also known as the base of gouache painting’s Renaissance. The splendid and exquisite paintings do not have artists spirit, but are foremost records of landscapes and sketches from life. His microlandscape painting works are a faithful picture of one flower, one leaf, one world whereas his flower painting bears a striking similarity in appearance with Southern Song academical painting. 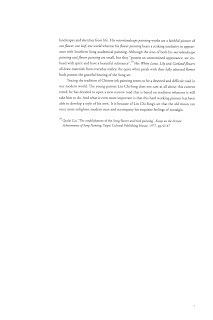 Although the sizes of both his microlandscape painting and flower painting are small, but they “possess an unrestrained appearance, are imbued with spirit and have a beautiful substance”. His White Lotus, Lily and Garland flowers are draw materials from everyday reality; the quite white petals with their fully adorned flower buds possess the graceful bearing of the Song art. Tracing the tradition of Chinese ink painting seems to be a deserted and difficult road in our modern world. The young painter Lin Chi-fong does not careat all about this current trend; he has decided to open a new narrow road that is based on tradition whatever it will take him to do. And what is even more important is that this hard working pioneer has been able to develop a style of his own. It is because of Lin Chi-fong’s art that the old moon can once more enlighten modern man and accompany his exquisite feelings of nostalgia.